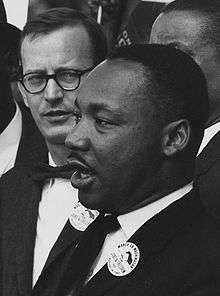 Ahmann on August 28, 1963, behind Martin Luther King, Jr.
Mathew H. Ahmann (September 10, 1931 – December 31, 2001) was an American Catholic layman and civil rights activist. He was a leader of the Catholic Church's involvement in the Civil Rights Movement. Mathew Ahmann was born on September 10, 1931 in St. Cloud, Minnesota, to Norbert Ahmann, a dentist, and Clothilda Ahmann a nurse, née Hall. Ahmann's grandfather, Mathew Hall, was a German-American immigrant and St. Cloud businessman. Ahmann was the oldest of three brothers; in their family religion was a large part of everyday life as they attended catholic school and religious retreats. They each attended Saint John's Preparatory School in Collegeville, Minnesota. Ahmann grew up a boy scout and playing music in a band. Leaders from 78 denominations attended, and speakers included Martin Luther King, Jr., Sargent Shriver, and Abraham Joshua Heschel. An individual whom attended the conference believed it was an achievement in itself that Protestant, Catholic Jewish and Orthodox leaders had even come together. He says “A total of 1,000 delegate-- about 750 official delegates and 250 observer delegates” attended. After Ahmann's speech, Heschel invited Ahmann to the stage and said, "We are here because of the faith of a 33-year-old Catholic layman." Heschel kissed Ahmann on the head, and Ahmann received a standing ovation. A journalist whom attended concluded that even if the attendees did nothing after they left the conference, they would never be the same. He also explained that after the conference it was expected for committees of the three religions would to form on local and regional levels but in order to be successful they needed to be more unanimous in action not independent. Ahmann (far left) at the Civil Rights March on Washington, D.C., 1963. Ahmann was asked by organizers of the 1963 March on Washington for Jobs and Freedom to find a Catholic bishop who would serve as a Catholic chairman for the march. Unable to find a willing bishop, Ahmann himself volunteered to join the organizing committee and make a speech at the march. Ahmann, as the Catholic presence, along with white leaders Walter Reuther, Eugene Carson Blake, and Joachim Prinz, joined the original "Big Six" to organize the march as the "Big Ten." Ahmann's speech preceded King's "I Have a Dream" speech. In 1965, Ahmann urged all United States diocese clergy to attend the Selma to Montgomery marches, in response to King's call for participation. In the same year, Ahmann gave the commencement speech at the College of Saint Benedict, where he encouraged women to fight for rights. In 1967, Ahmann wrote a letter to the incarcerated King, saying, "Our conference sends you greetings while you serve sentence for your witness for humanity, dignity and justice. "The King Center has uploaded this telegram to their online archives for the public to view. 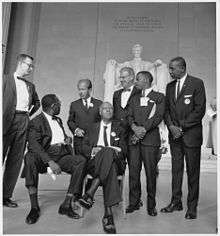 Ahmann continued to show his support to King and the movement in 1967 when he sent a on the 10 year anniversary of the Southern Christian Leadership Conference to congratulate them on all of the work they had done and continued to do for human rights. Ahmann worked with the National Catholic Council for Interracial Justice until 1968. In 1969, he moved to Texas and became the executive director of the Commission on Church and Society for the Archdiocese of San Antonio. During the 1972 presidential election, Ahmann worked for vice-presidential candidate Sargent Shriver. He then worked for 16 years as the associate director of government relations for Catholic Charities USA in Washington, D.C.. He was also an executive committee member of the Leadership Conference on Civil and Human Rights. Ahmann died of cancer on December 31, 2001, at Sibley Memorial Hospital in Washington, D.C. A memorial mass was held at the Shrine of the Most Blessed Sacrament in Washington, D.C, on January 12, 2002. William L. Taylor remarked, "Mr. Ahmann was a quiet voice of conscience in the civil rights movement, who helped make the Leadership Conference the effective organization that it is today." In October 2013, Ahmann was posthumously awarded the Colman J. Barry Award for Distinguished Contributions to Religion and Society from Saint John's University. Wikimedia Commons has media related to Mathew Ahmann. 1 2 3 4 5 6 7 8 Duffy, Brendon (2013). "Acting on Faith". Saint John's Magazine. Saint John's University. Summer/Fall 2013: 24–31. Retrieved November 11, 2013. 1 2 3 Maurice, Jim (August 28, 2013). "St. Cloud Man Instrumental In Organizing 'March On Washington' in 1963". WJON. Retrieved 12 November 2013. 1 2 3 4 5 Walberg, Matthew (January 7, 2002). "Mathew H. Ahmann, 70: Founder of Catholic interracial group". Chicago Tribune. Retrieved 12 November 2013. 1 2 Kelley, Kitty (13 August 2013). Let Freedom Ring: Stanley Tretick's Iconic Images of the March on Washington. Macmillan. ISBN 1250022835. 1 2 3 Murray, Paul T. "From the Sidelines to the Front Lines: Mathew Ahmann Leads American Catholics into the Civil Rights Movement." Journal of the Illinois State Historical Society 107.1 (2014): 77,115,8. ProQuest. Web. 13 May 2015. 1 2 Mays, Benjamin E. "MY VIEW: The National Conference on Religion and Race." New Pittsburgh Courier (1959-1965), National edition ed. : 11. Feb 02 1963. ProQuest. Web. 15 May 2015 . ↑ Euchner, Charles (25 September 2010). Nobody Turn Me Around: A People's History of the 1963 March on Washington. Beacon Press. ISBN 0807095524. ↑ "Telegram from Mathew Ahmann to MLK". thekingcenter.org. Retrieved 3 June 2015. 1 2 3 Russell, Michelle (16 January 2002). "Mathew H. Ahmann, Catholic Activist and Former Leadership Conference Executive Committee Member, Dies at 70". The Leadership Conference. Retrieved 27 December 2013. 1 2 "Mathew H. Ahmann: Obituary". Chicago Tribune. January 4, 2002. Retrieved 12 November 2013. ↑ "Ahmann '52: Fifty Years Since the March on Washington". Saint John's University. 20 August 2013. Retrieved 12 November 2013.